...hypersonic speeds this weekend during a technology demonstration test from the agency's Wallops Flight Facility on Wallops Island, Virginia. NASA has four consecutive days of launch opportunities for the agency's Inflatable Re-entry Vehicle Experiment (IRVE-3), starting July 21st, with the liftoff window from 6:00 a.m. to 8:00 a.m. EDT each day. The test is designed to demonstrate lightweight, yet strong, inflatable structures that could become practical tools for exploration of other worlds or as a way to return items safely to Earth from the International Space Station. During this technology demonstration test flight, NASA's IRVE-3 payload will try to re-enter Earth's atmosphere at hypersonic speeds—Mach 5, or 3,800 mph to 7,600 mph. The IRVE-3 experiment will fly aboard a three-stage Black Brant XI launch vehicle for its suborbital flight. The payload and the heat shield, which looks like a large, uninflated cone of inner tubes, will be packed inside the rocket's 22-inch-diameter nose cone. About six minutes after launch, the rocket will climb to an altitude of about 280 miles over the Atlantic Ocean. At that point, the 680-pound IRVE-3 will separate from the rocket. An inflation system similar to air tanks used by scuba divers will pump nitrogen gas into the IRVE-3 aeroshell until it becomes almost 10 feet in diameter. Instruments on board, including pressure sensors and heat flux gauges, as well as cameras, will provide data to engineers on the ground of how well the inflated heat shield performs during the force and heat of entry into Earth's atmosphere. 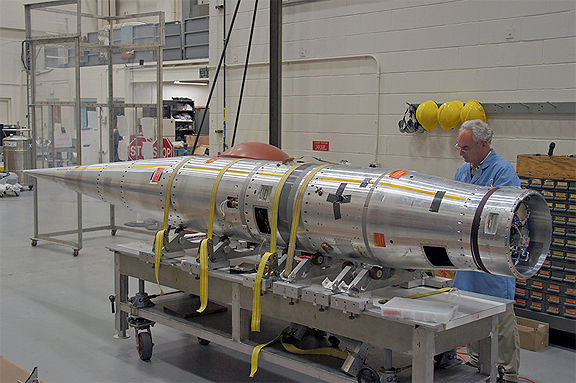 After its flight, IRVE-3 will fall into the Atlantic Ocean about 350 miles down range from Wallops. From launch to splash down, the flight is expected to take approximately 20 minutes. A three-stage Black Brant XI sounding rocket similar to this one will launch the Inflatable Reentry Vehicle Experiment (IRVE-3) about 280 miles (451 kilometers) into the air over the Atlantic Ocean. The IRVE-3 will separate from the nose cone, inflate and plummet back through Earth's atmosphere. "We originally came up with this concept because we'd like to be able to land more mass and access higher altitudes on Mars," said Neil Cheatwood, IRVE-3 principal investigator at NASA's Langley Research Center in Hampton, Virginia. "To do so you need more drag. We're seeking to maximize the drag area of the entry system. We want to make it as big as we can. The limitation with current technology has been the launch vehicle diameter." Cheatwood and a team of NASA engineers and technicians have spent the last three years addressing the technical challenges of materials withstanding the heat created by atmospheric entry and preparing for the IRVE-3 flight. The team has studied designs, assessed materials in laboratories and wind tunnels, and subjected hardware to thermal and pressure loads beyond what the inflatable spacecraft technology should face during flight. This test is a follow on to the successful IRVE-2, which showed an inflatable heat shield could survive intact after coming through Earth's atmosphere. IRVE-3 is the same size as IRVE-2, but has a heavier payload and will be subjected to a much higher reentry heat. 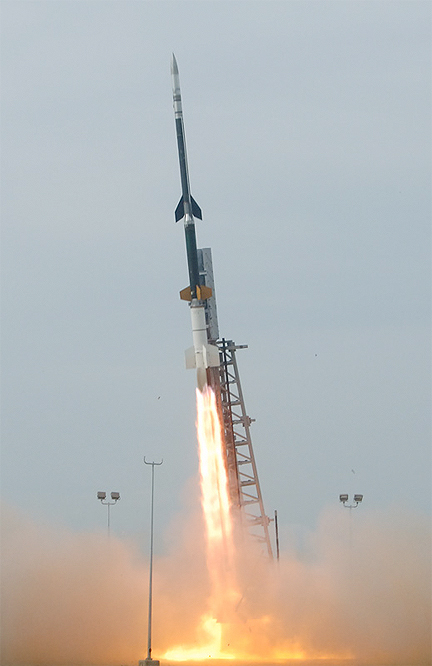 IRVE-3 is part of the Hypersonic Inflatable Aerodynamic Decelerator (HIAD) Project within the Game Changing Development Program, part of NASA's Space Technology Program. Langley developed and manages the IRVE-3 and HIAD projects.